Super-Couponing - Jill Cataldo's reach and influence - Changing the way you shop... forever! On television, in the newspaper, on the radio and on the web, Jill Cataldo's voice is trusted by her audience. And, as a widely-read consumer blogger, Jill (and her readers) have seen first-hand how quickly word can spread among her followers. Jill Cataldo has seen how her interaction with her readers has established a high trust level between herself and her audience. Do not underestimate the influence of grocery bloggers, as one single post about a product can cause stores to sell out of a product rapidly. 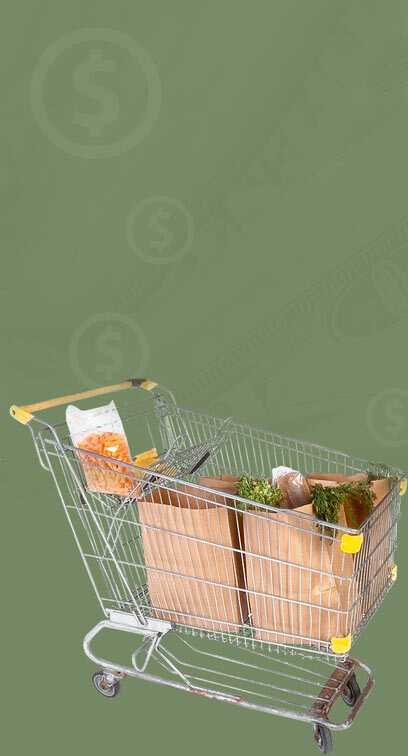 Jill blogs grocery deals in Chicagoland to a readership numbering over 30,000 unique visitors each week. And when all of those people go shopping for the same item at the same time... what happens? "One of our major supermarket chains has told me that they have tracked specific sales, where products have blown out of the stores, back to individual posts in my Deals of the Week blog writeups. I'm sure it's not difficult for any grocer to do that if they are paying attention! "One week, we had a crazy sale on Breyers ice cream, in which if you bought four tubs, you received a Catalina for money off your next order, plus a $4 Catalina coupon for 4 more tubs of Breyers. After both discounts, the ice cream was free. "After blogging about the sale, I returned to the store that same afternoon..."
"One lonely tub of Breyers sat on a shelf. Remember, you had to buy four cartons to do the deal. 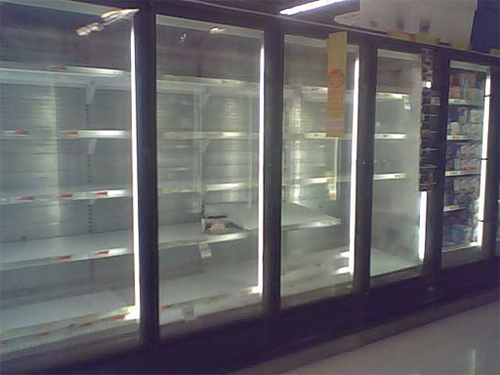 Four entire freezer cases emptied completely within hours... and this was just one store. Readers reported seeing massive numbers of people buying up Breyers, four cartons at a time, all over Chicagoland during this sale." "Last summer, I attended a bloggers' appreciation dinner sponsored by General Mills. The dinner took place at an upscale Chinese restaurant in downtown Chicago. But what we thought was an appreciation event turned into a candid-camera-style taping for a Wanchai Ferry frozen dinner commercial when it was revealed (in fortune cookies over dessert!) that the main course of the night's dinner was not Ben Pao's usual menu, but rather frozen meals from Wanchai Ferry. "I blogged about the event for my readers, because it was fun, and I wanted to share the experience of being 'ambushed' into a commercial with them. "Shortly after I wrote about the Wanchai commercial event, I noticed that it was getting harder to find Wanchai Ferry dinners in the freezer case! Remember, I didn't even blog about there being a sale on the product... people just went out and bought it because they'd read about me being featured in a commercial for it." "Just one Wanchai was left in the case on the day I went shopping. Why do you think so many people decided to try those dinners, all at the same time? 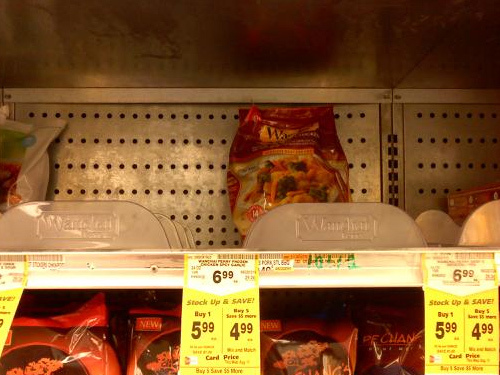 My area store told me that Wanchai was "flying off the shelf" the week that I wrote my post about the commercial taping. "It is very humbling (and incredible) to me to physically see things like these. It's real, tangible evidence of how much what I write influences people." 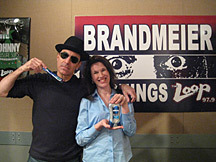 Jill Cataldo's a longtime regular on the Jonathon Brandmeier radio show in Chicago with her "Deals of the Week" grocery coupon savings radio segment. "Deals of the Week" often features a good deal of audience participation, with a healthy amount of morning-radio irreverance thrown in for good measure. While the segment often strays beyond groceries alone, listeners repeatedly clamor for savings talk with Jill... on the largest rock radio station in Chicago, with a predominantly male demographic! (Note: Jonathon Brandmeier is currently between radio contracts and is temporarily off the air. "...sent my husband to Target and the entire store was out of Swiffers! LOL. The manager said "I dont know what's up with these things, but they're popular lately." Open Nature sausage sale...the signs are still up and it is an April date, but they are out of the apple/maple at the 2 Doms I go :-) Jill you are such a good promoter! "Jill, I too, tried the apple sausage ONLY because you had said how good it was in the blog, and that it was a good price. Honestly, I don't really even like sausage, but my husband does, and I figured if you liked it and it was a good deal -- you couldn't go wrong!" Yes, you do influence us. I bought Wanchai Ferry that week, too, and I bought sausage this time because of what you said... If you did not say they were good, I would not have bought any. And that's a fact.